From the Garden State of New Jersey comes the three-song Demo from vocalist/bassist Pete Washuta, drummer Keith Hasselbrink, and guitarist Don Anderson, the trio collectively assembled as GREEN INFERNO. I will be honest, when it comes to music I associate with New Jersey, the very first thing that I think of is thrash. Of course, it being home to my favorite metal band, Overkill. Moving past that, I go straight to stoner rock like that of Monster Magnet and The Atomic Bitchwax, or past acts like Core, Halfway To Gone, or Thousand Knives Of Fire. 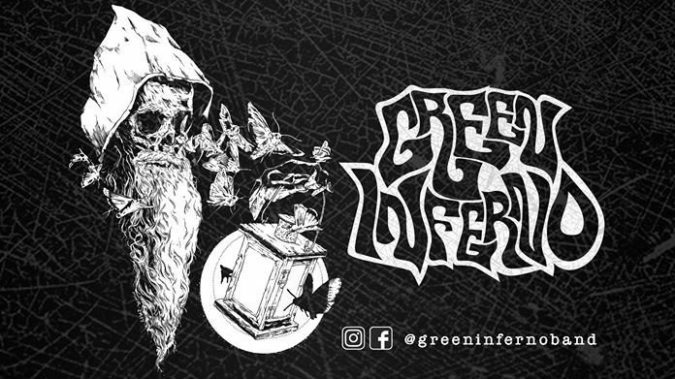 From now forward that will have to change slightly, as GREEN INFERNO wields an infectious blend of stoner-enriched, southern doom rife with coarse fuzz and groove to spare. Straight from a school of influences like Buzzov’en or Weedeater, this music is a harsh heaviness structured around murky, distorted riffs of gargantuan mass. Backing them are muscular bass lines serving to brace things in place while thunderous drums strike away and hammer it all down. The full breadth of songs, “Blood Moon“, “Unearth The Tombs“, and “Spellcaster” obtain an overall sound that almost seems beyond measure. In layman’s terms, this is substantive sonic output. For sludgy doom, demo quality sludgy doom with acidic vocals to boot, this material overall has a surprisingly good sound to it. I’m trying my best not to use the word “polished,” but let’s just say all aspects are discernible and well-defined. All in all, a thoroughly solid effort for any band, especially one on their first time at bat. Stream the Demo from GREEN INFERNO in this review, or you can find further streaming at Bandcamp [HERE] where the digital version is currently NYP (Name Your Price).